Elizzabeth Hope: Let's Talk Fashion : Oversized Sweaters & Scarves! Let's Talk Fashion : Oversized Sweaters & Scarves! Every time (Well not every time) but most of the time when I see Lauren Conrad in this outfit she looks effortlessly amazing! This is an outfit I'm dying to try out for the fall season! There's nothing better than wearing comfortable clothes for the fall season! So oversized sweaters and shirts are a must have for your wardrobe! 1. Wear cropped pants to balance the bulkiness of the sweater! 3. Try adding a collared shirt under your sweater for the "Preppy...Look at my I'm a college student" type of look! haha! 1. If your scarf isn't knit than make sure it's wide so when you wrap it around your neck so it will look thicker. 2. Make sure that your scarf isn't thin and narrow! It's not going to wrap well or look like the look we are looking for. 3. Infinity scarves work best for the look we are trying to achieve! Hope you got some awesome tips for this fall look!!! If you wear this don't forget to tweet me a pictures! @ElizzabethHope! If and when I get enough pictures I will do a future post of how people style it! Comment Question! What's your favorite fall trend?! I want to know! You clearly don't live in the UK. Lol! I do love oversized sweaters and jumpers, they're so comfy and cute, I'm a huge fan of knitwear, but I do not want the warm weather to go away. We've had tonnes of rain here and the past few days its been nice and I don't want to have to wear my knits again. It gets soooo cold here in England. Can we swap? I'd love to live somewhere warm where I can wear shorts and a tank all the time. hahah! No I'm not from the UK but I am from the US! haha! I wish I was there right now! The Olympics!!! So cool! But I'm sure it's major busy there! haha! Thank you so much!! I'd love to follow each other! I'm not really sure if I can pull of oversized clothing. I feel like it would consume me since I'm pretty small. It looks really cute, though! I see your problem! haha! I looke the pictures and the look! I have followed you back with pleasure! Thank you so much Andy!!! That really means alot to me! I seriously cannot wait for fall weather to arrive so I can start layering up! I am very very excited for Fall fashion, the thing I am most looking forward to is large scarfs. I love love scarfs it is one of my favorite accessories. I'll invite you to my blog. Hey girl great blog!Thanks for your comment...of course we can follow each other,let me know when you're done and I'll follow back for sure! Awesome trend! Thanks for your tips! No prob! Thanks for stopping by GMF!!! Amazing post! 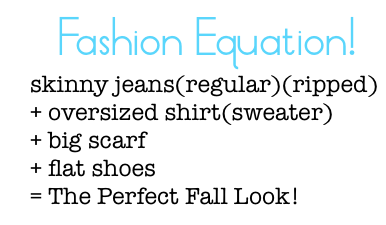 I couldn't agree more about the perfect fall look. Your necklace in the video is so cute! Hi dear thanks for the follow,of course I follow you back...happy blogging! I love these autumn trends ! And really nice videos :) I wanna try make videos too ! Hi dear! So beautiful selection! Thank u so much for you lovely comment onn my blog! New post is up! Hight Low Obesession! good posting about Let's Talk Fashion : Oversized Sweaters & Scarves! Perfection indeed. Great tips gorgeous.